E tosha National Park has always been this magical place that surrounds a great white spot on the map, sparkling like a jewel in the crown of Namibia. Visits to the park have for years been spent watching plains game, lions, rhinos, elephants and more on the immense pan and the surrounding savannah. Intermittent paths that veer off the main circuit around the pan are lined with a little more foliage, but the most iconic images of one of Africa’s most popular parks are the stark open landscapes or animals covered in tell-tale white mud that roam the land like ghosts. 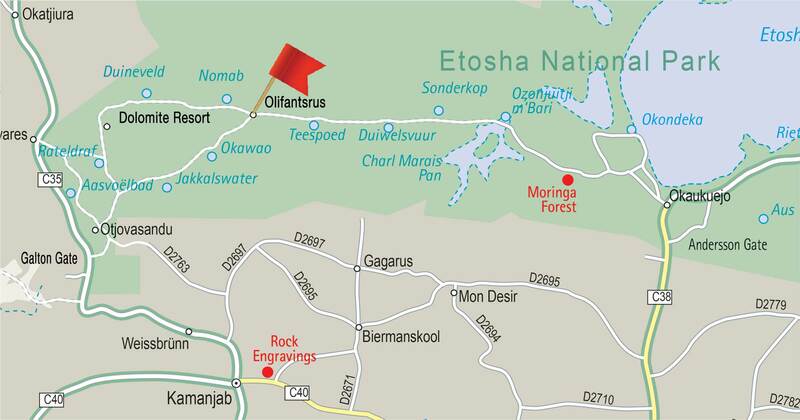 In fact, until very recently there was no popularised notion or name for the blank edges on the map of Etosha National Park that lie to the west of the pan. No one ever really spoke of that part. 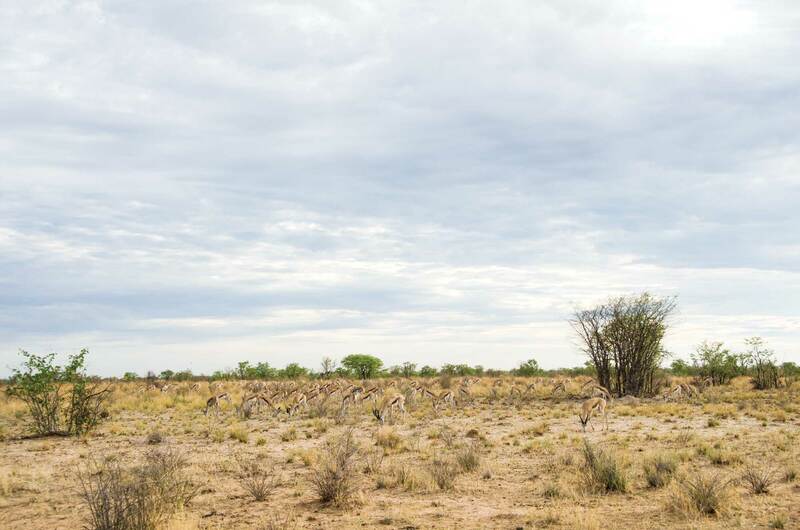 It was rarely mentioned in stories or in National Geographic’s Attenborough-esque documentaries, probably due to the fact that Western Etosha had for the most part been closed to the public. Like a blank space on the map, Western Etosha is one of the country’s best-kept secrets. Its wilderness waiting to be explored. Since the opening of NWR’s Dolomite Resort in 2010, guests of the lodge pass through this part of the park en route to the resort. 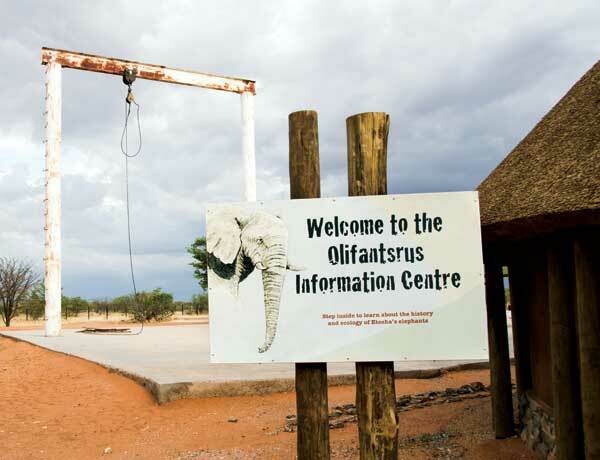 In February 2014, Olifantsrus Camp and the road leading to it were opened to the public, along with the new Galton Gate on the western border of Etosha. Today the gates of Western Etosha are thrown wide open for all to enjoy its wild and wonderful landscapes. Etosha, “the great white place” in the Ndonga language, gets its name from the characteristic pan which is so large that it can even be seen from space. 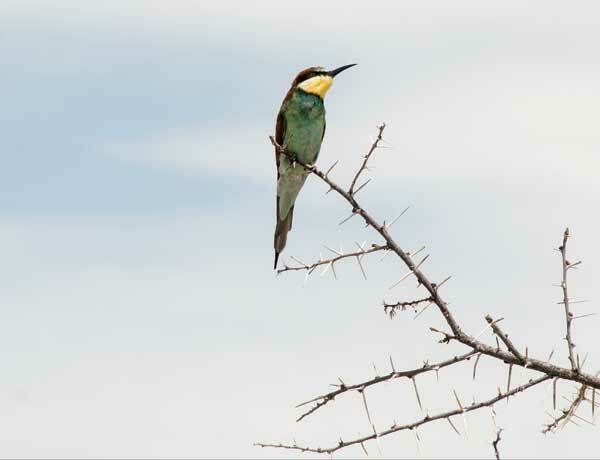 If you venture a few kilometres west of Okaukuejo, however, The Great White Place trades its iconic salty white expanse for mopane woodland, lots of grass and largely undiscovered wilderness. 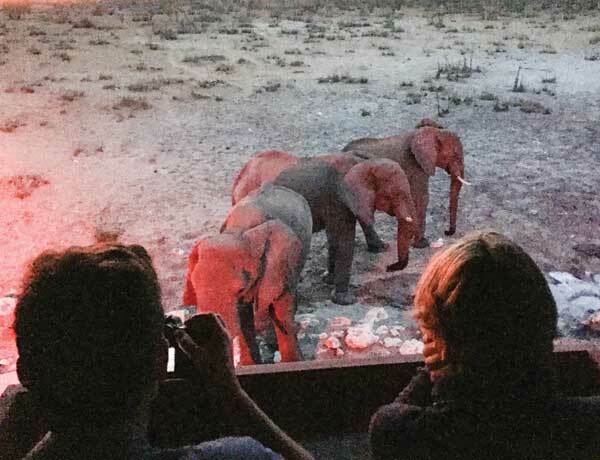 Regular visitors to Etosha National Park have most likely become accustomed to the way in which plains game have claimed the park as their own. You have no right of way on the gravel roads traversing the park. This is their kingdom, their territory, and you in your measly metal machine can sit and wait for them to cross in their hundreds and at their leisure. This is not the case in western Etosha. Unaccustomed to the regular throng of motor vehicles, antelope stick to the dense bush and grasslands, making themselves visible only in scattered bursts of activity as the rare oncoming traffic spooks them out of their reverie. Glimpses of herds of wildebeest, red hartebeest, zebra and a few kudu were all we saw of the game that inhabit or meander along the gravel road through this side of Namibia’s most famous national park. 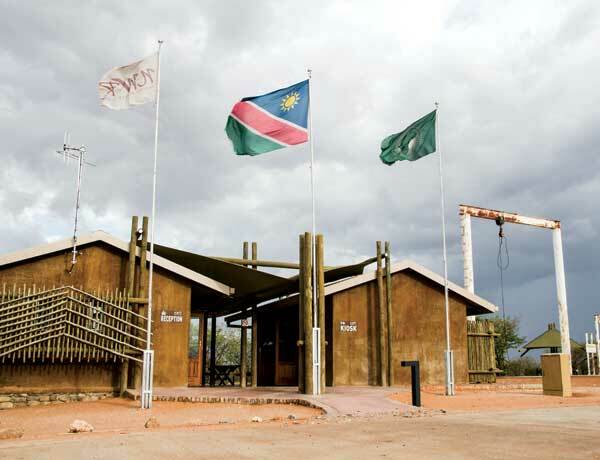 Olifantsrus Camp was officially opened in February 2014. Situated 130km from Okaukuejo and just 60km from Galton Gate it serves as the perfect stopover for nature and camping lovers who travel through this part of the park. Olifantsrus is the only establishment in the park that caters solely to campers. On the road to the camp we were treated to amazing sightings despite the wild nature of the critters in the bush. 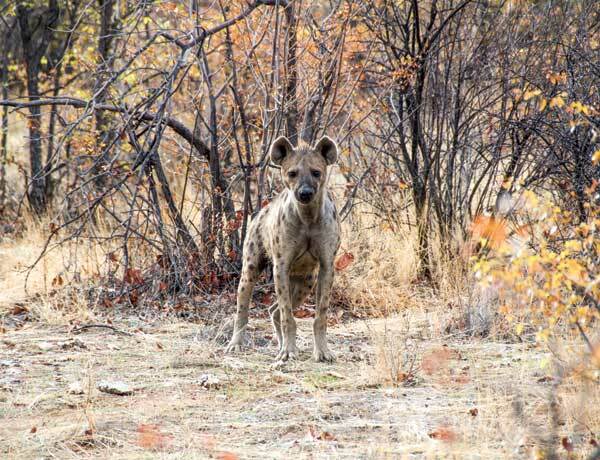 One special wild friend made quite a few appearances along the way… the spotted hyena. Peeking out from between the branches of young mopane trees or leisurely napping in the shade of a bush, we saw these speckled carnivores a few times during our journey. Another pair of oddballs that you don’t see every day crossed in front of our car just a few kilometres from the camp. Bright and early in the morning, two honey badgers darted across the road, short on each other’s tails as they made headway into the bush. Not a common site on a safari, especially not in broad daylight. Our day at Olifantsrus was both relaxed and riveting. 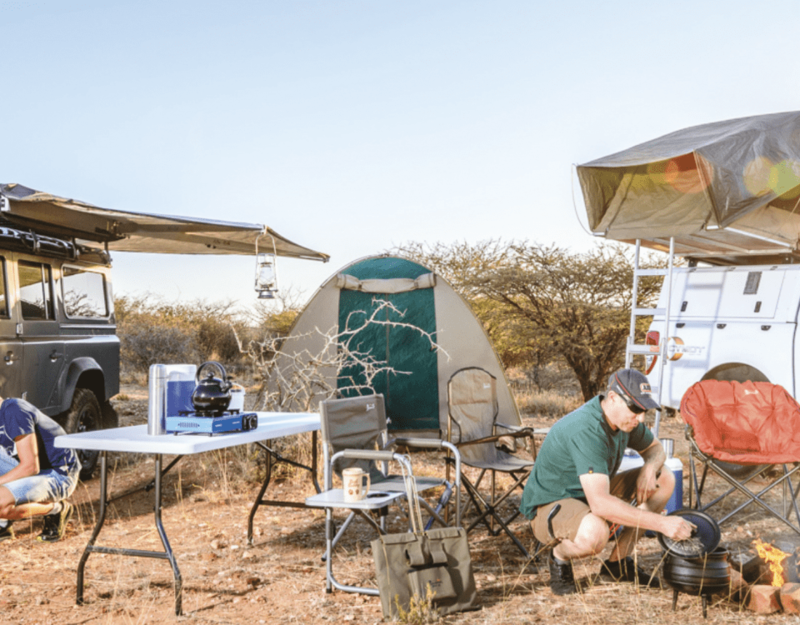 The camp has 10 beautifully laid out campsites, each equipped with power points, clean running water, a braai and a mopane tree or two. The ablutions are close-by and still new and shiny and the reception area and kiosk provide you with all the necessities, including snacks, drinks and even breakfast and small meals. There are also shaded wooden picnic spots for day visitors on their way to their next destination. The camp is fenced-in to keep the carnivores at a safe distance from your evening braai. A wooden boardwalk leads to the state-of-the-art hide. A spotted hyena – always a curious critter. 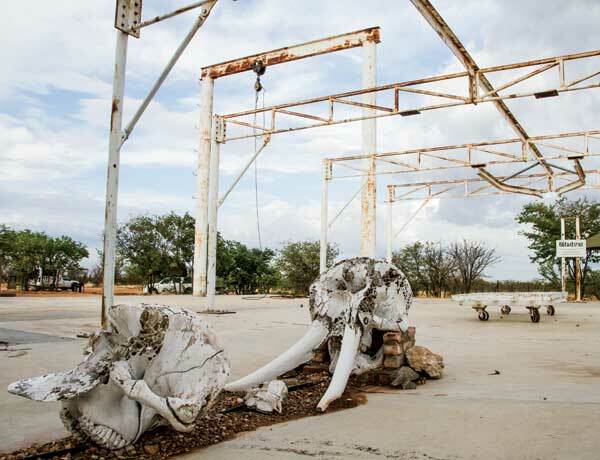 The history of the camp is blemished by the controversial topic of elephant culling. In the 80s, during the period of South African military presence in what was then South West Africa, an increase in elephant poaching in the north-western regions caused elephants to flee to the south and east, into Etosha National Park. This resulted in the compression of the elephant population. After much deliberation the decision was made to follow the example of the Kruger National Park in South Africa. Culling took place in an attempt to decelerate desertification brought on by an over-population of elephants, which threatened the survival of other species, including the endangered black rhinoceros. One aspect of the camp far outshines the rest, however. The hero of the story. The real MVP. The Olifantsrus hide and waterhole. The tower-like structure is situated just outside the boundary line. 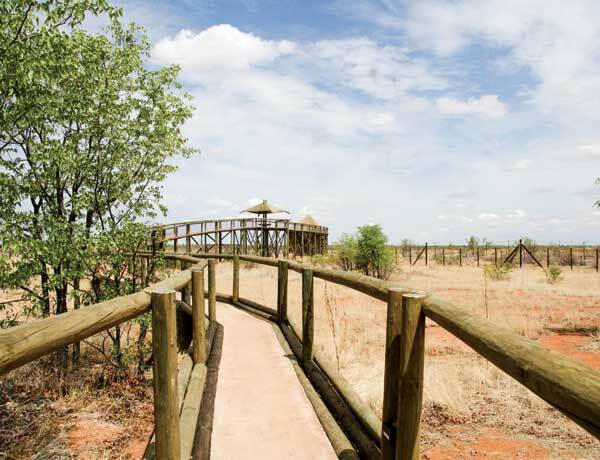 A boardwalk leads from inside the camp and over the fence to the second storey of the hide. The man-made waterhole forms a half-moon around the base of the tower. When perched in your seat like royalty you are treated to an unobstructed view of animals quenching their thirst right below you. We must have spent at least eight to ten hours lazing in our castle on the western plains. Oryx, red hartebeest, secretary birds and jackals came and went. At dusk, as the setting sun painted the sky with one of the most dramatic displays of colour I have ever seen, three large silhouettes appeared on the northern horizon. Trunks pointed towards the sky picking up the smell of aqua in the air. For more than half an hour we watched the group of elephant bulls make their long journey to the waterhole, which just goes to show the extent of the view one is afforded from up there. The bulls spent an hour drinking at the waterhole, occasionally lifting their trunks to take a sniff in our direction. 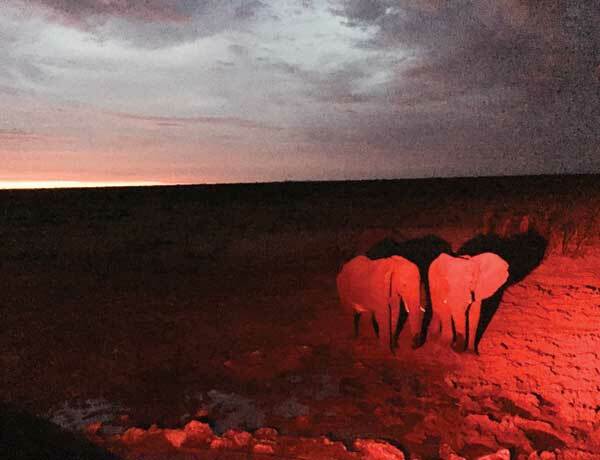 Red floodlights lit the site without deterring the animals. When the sun had set completely, another very welcome guest joined the party. A black rhinoceros bull sauntered up to the waterhole from the west. He had a scrape along the side of his body, a battle scar from a fight, probably with a lion, on a day past long since. It branded him a winner, a fighter, a survivor, which is something rhinos in Namibia really have to work at these days. The scar tissue built up along the wound showed its age, though his skittish nature made us wonder if the scare was still fresh. He kept raising his head to peer into the darkness above where we hid in the shadows, and even though he couldn’t see us he smelt us and knew we were there. We spent what felt like ages staring in stunned disbelief at the ivory-bearers. We felt so lucky. They were so close. The experience so unreal. Had I been inclined to stretch out my arm and had one of the elephants been in the mood to stretch out his trunk we could have touched in a very Sistine Chapel/ET-like moment of connection. John Muir was once quoted as saying: “The clearest way into the universe is through a forest of wilderness”. I have been to Etosha many times before, seen many great things and experienced moments that will never leave me. But now there is a very special place in my heart for the mopane woodland and grasslands that are stretched out west of the pan. From its unruly vegetation to the boisterous herds of animals unaccustomed to people, the wildness of this part of the park lends a special charisma to the experience. For years we have been spoilt for choice, now the beauty lies in the fleeting glimpses, the priceless moments that disappear as quickly as they came. Take the left turn and embrace the adventure that is the wild side of Etosha National Park. “Taking the life of an animal, let alone entire herds of a species regarded as highly intelligent, is a decision made only after careful analysis and circumspection. No wildlife manger or game ranger enjoys such a task that is only undertaken on the basis of holistic assessment” – from the Olifantsrus Information Centre. 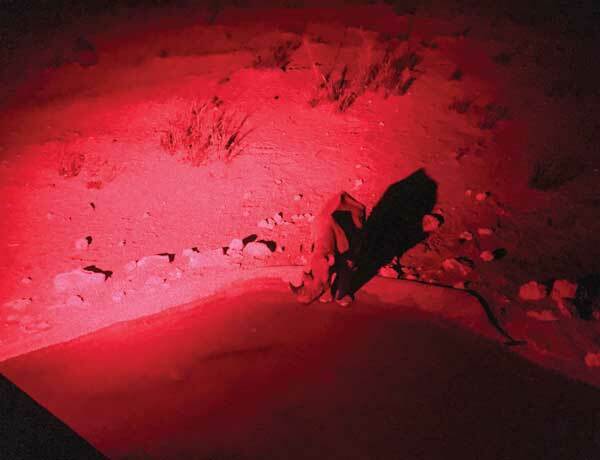 Red floodlights provide illumination without deterring animals. A black rhino bull sneaks a few sips. I’m impressed by your writing. Are you a professional or just very knogaedwelble?